​The flourishing of the person is tied to the flourishing of the community...Something as simple as gathering in community and playing your own music, dancing to the music, and just sharing in community...can seem very common and not so radical. But ...the effects of those practices in helping the person develop a strong sense of personal value, in a way that is different from the broader society, both help the person and strengthen the community, My mom use to have this saying about practices that were rich: "they thicken my bones." I first discovered the Christian theologian Mayra Rivera many years ago, in reading her book The Touch of Transcendence: A Post-Colonial Theology of God. I loved the book and I loved the title. I play singalong music for people in their eighties and nineties at assisted living centers, and I had been looking for a phrase to name what I think people experience when they are singing together. As they sing, they are momentarily taken up into something more than them but also within each of them, something that transcends but includes their individual personhood. They are experiencing what, as a Christian, I would call a holy communion, except the bread is melody and the wine is rhythm. The communion is not abstract. An ethnomusicologist, Christopher Small, calls it musicking. For the folks in their eighties and nineties, such musicking is, in its own way, subversive. It is not easy to be old in a youth-centered culture; we do not live in an all-age-friendly world. We live in a youth-centered world. Older people sometimes feel that they are beyond the pale, that they have been left behind, that the world has passed them by, that they are no longer valuable because their bodies and minds are not intact. They carry within their minds a norm which says "You should be young." And yet, in the moment of singing, they think and feel about themselves in a different way. They are alive and vital. They are engaging in a practice which, in the words of Maya Rivera's mother, thickens their bones. At least their spiritual and emotional bones. So what are they -- we -- experiencing in that moment of holy communion as together we sing "You are My Sunshine." Our experience is material, to be sure. Our ears and mouths and bodies are engaged with the music along with our memories. We are in the flesh and of the flesh. But our enfleshment -- our inter-incarnationality, to use a phrase of Mayra Rivera's -- is more than can be understood by a spectator's analysis, by a clinician doing a brain scan. It is what philosophers call a lived experience: that is, an experience which has its own first-person perspective, singular and plural. This lived experience, including its bodily component, is what I mean by "flesh." As a Christian I had been brought up to say that we were experiencing "God" or "the Spirit" in this enfleshed experience. But I also know that this language does not speak to everyone. After all, some people believe in God but think that God is a king on a throne not a rhythm in the singing. They don't find God in the here-and-now or in the flesh. And some people, perhaps reacting to the image of God as King, are repulsed by the very word "God." They think "God" names a figment of the human imagination, and that alone. And yet both groups experience touches of transcendence: that is, moments when they are taken out of their isolated selves into something wider and more beautiful, where they feel at home in their lives, in their memories, in their hopes. I began to use the phrase in the title of Rivera's book to name part of what I think is happening when people listen to, and singalong with, popular music. I began to say, and still say, that they are experiencing touches of transcendence. Her focus in The Touch of Transcendence was on how we experience touches of transcendence when encountering the presence of other people who are more than us but make a moral claim upon his. In the "face of the Other," so she said, influenced by the philosopher Levinas, we experience the contours of a transcendence difficult to name but present to us in the here-and-now. But toward the end of the book she also spoke of how we might experience such touches in the more-than-human world: hills, rivers, trees, stars. I was on board. Her book was, and remains for me, one of the best books in theology I had read in a long time. Mayra Rivera seemed to me then, and seems to be now, a theologian with her eyes and ears turned to the world, to this life, to how "transcendence" can be found in the flesh. It was not surprising for me to learn that her next book, published in 2015, was called Poetics of the Flesh. In that book she offers a unique understanding of flesh (which she distinguishes from body) and helps me realize that flesh is indeed the place where we find the vitality of life, if we find it at all. Flesh is not juxtaposed with spirit; it is in its own way the place of spirit. Rivera offers us a deep materiality: a materiality in which matter itself is understood as a process, a dynamic, of lived connections -- entangled connections, she likes to say. She well realizes that some of these entangled connections are deeply unjust and filled with agonies. She writes with attention, not to privileged middle-class whites like me, but to those with shattered histories. She has no interest in her ideas being transformed into a "system" or an "ontology." But she does aim to evoke, and she does. This page is simply an expression of thanks to her, hoping that what I say might encourage others to read her books, learn from her, and learn with her. It is the beginning of attention, a seriousness—which leads us to explore the world again in wonder, to describe it faithfully. We pray that our bodies may keep us open to others, to sense the entanglements of our carnal relations. Flesh is always becoming. Air, water, food, sunlight, and even societies of microorganisms enter our bodies to weave the delicate tissue of our flesh. Imperceptibly to the naked eye, cell by cell, day after day, the world constitutes your body and mine. And our bodies enter into the constitution of the world. They are intimately our own, singular and irreplaceable, and yet formed by and given to the world. The poetic approach is indispensable for addressing histories marked by disruption, displacement, and irrecoverable loss—such as those of Caribbean peoples, whose very existence emerged from the obliteration of African and indigenous cultures, religions, and languages. An intellectual practice attentive to such events shuns totalizing forms of thought and writing. It questions the search for legitimacy in genealogies and the drive to produce ontological systems, theories of the nature of being itself. Instead of privileging the genres of stable, ordered unity, Glissant is inspired by Caribbean poetics, which Derek Walcott describes as a “gathering of broken pieces.” “Break a vase, and the love that reassembles the fragments is stronger than the love that took its symmetry for granted when it was whole,” Walcott writes. “This gathering of broken pieces is the care and pain of the Antilles.” The pieces might be disparate and ill-fitting; they contain more pain than the icons and sacred vessels from which they originated. “Antillean art is this restoration of our shattered histories, our shards of vocabulary.” For Glissant, poetics is an approach to knowledge that values processes of creation from “shattered histories” and “shards of vocabularies” and acknowledges their discontinuities. ​Rivera, Mayra. Poetics of the Flesh (Duke University Press, 2015). Theology can be more than dry-as-dust prose. It can be a poetic love song about life in the flesh. Below please find eight kernels of wisdom from Mayra Rivera about life in flesh, taken from her Poetics of the Flesh (Duke University Press), her video interview (below), and her article called "Glory: The First Passion in Theology." Flesh is more than skin. It is our felt connections with the world, positive and negative, as lived from the inside, in embodied ways. Flesh includes our skin but also our subjectivity. Flesh is emotional. It includes pain and pleasure, sadness and joy, despair and hope, hatred and love. It includes what Whitehead calls the "subjective" forms of life. Flesh is relational. The subjective forms are always relational: that is, responses to the many worlds that are given to our experience: physical worlds, emotional worlds, social worlds, imaginary worlds, worlds made by others, worlds made by us. Flesh is vulnerable.​ Our flesh connects us to the worlds of our experience, and our flesh makes us vulnerable to those worlds. Glory is more than the attribute of a transcendent God. It is the spectral luminosity of everyday life, even with its pain and ambiguity. Loveliness is more than prettiness. It is the value of life itself - in and for itself - anywhere and everywhere. We seek justice in the world, we fight for the flourishing of each and all, not just because we suffer with others, but because we sense the luminosity and love the loveliness. ​Justice begins with practices and sometimes they partake of the loveliness: "The flourishing of the person is tied to the flourishing of the community...It's something as simple as gathering in community and playing music their own music, dancing to the music, and just sharing together." When we touch the flesh of others, and allow ourselves to be touched by them, in caring and vital and just ways, we experience touches of transcendence, without needing to name what touches us. We touch what some might call God. Excerpts from "Glory: The First Passion in Theology?" To convey the qualities of an elusive, luminous halo: this may be the aim of theology, as much as it was the goal of Woolf’s fiction. It is, indeed, what has led me to the image of glory. Not the blinding lights of its triumphalist counterfeits, the reflection of gold, or the glamour of celebrity, but a quality inseparable from life in all its fragility and ambiguities. Displaying both light and darkness, this halo is perhaps like the almond-shaped auras of Byzantine iconography – also called “glories.” It is the spectral luminosity of ordinary things, neither irresistible nor self-sufficient, but incessantly alluring. It is often barely perceptible, yet some-times disconcerting – even terrifying. The apparent aberrations of its depictions do not diminish a theologian’s zeal to convey its varying, hazy radiance. Drawn by passion to the glory that flickers in the midst of everyday life, theology speaks of its “unknown and uncircumscribed spirit.” This is a spirit that cannot be confined to neatly defined theological concepts or categories. And yet theologians persist in our weak attentiveness, “resolute” (Keller) in our attempts to describe it, however inaccurately and distortedly. We seek, with feeble words and images to express the inexpressible, in a multiplicity of voices, languages, and genres. It is clearly not amenable to calculation and cannot be called a method; it might include a little bit of imagination and no less poetic folly. Such a polydox theology attends to the devastating realities of pain and oppression without losing sight of the marvelous qualities of ordinary life, without ever believing that it has at last discovered the absolutely real. It does not so much abandon traditional symbols or critical analysis as move in them, to open spaces for indeterminacy and wonder, dis-enclosing theology, to experience glory in our perennially unfinished and redeemable world. It seeks to cultivate the capacity to endure wonder – creative in its receptivity, persistent in its disposition. The flourishing of creatures may well depend on this capacity to welcome the wonder before the weight of reality, of a human face, a bush, a passing cloud,or a burning fire. The flickering of glory in ordinary life. I welcome the wonder before the weight of reality. In a perennially unfinished and redeemable world. The poem might be titled "Theology as Wonder Welcoming."" This is not the kind of theology I learned many years ago in seminary. That theology was preoccupied with right belief and not at all about paying attention to the flickering of glory in ordinary life. It was all about arguments and merit badges, but not enough about welcoming a multiplicity of voices, languages, and genres. It was about the glamour of well-known western scholars but not the glamour of passing clouds, burning bushes, and human faces. It was too scholastic and not Zen enough. But something is certainly changing with theologians like Mayra Rivera. She is a Latina theologian who, along with many, many others in postcolonial theologies, are introducing tastes of very new wine. Her words come from an essay called "Glory: The First Passion of Theology?," which appears in Polydoxy: Theology of multiplicity and relation. Edited by Catherine Keller and Laurel C. Schneider. New York: Routledge, 2011, the essays in Polodoxy seek "to explore the results of postcolonial/poststructuralist/postmodernisms and process thinking on contemporary Christian theology." The goal of the anthology is to bring new life to Christian theology and Christian faith by opening up previously closed doctrines to the vitality that multiplicities and pluralisms bring. "Mayra Rivera is Professor of Religion and Latinx Studies at Harvard University. She is also chair of the standing Committee on Ethnicity Migration Rights and a faculty member in Harvard’s doctoral program in American Studies. Rivera works at the intersections between continental philosophy of religion, literature, and theories of coloniality, race and gender—with particular attention to Caribbean postcolonial thought. Her research explores the relationship between discursive and material dimensions in shaping human embodiment. Her book, The Touch of Transcendence: A Postcolonial Theology of God (2007), explores the relationship between models of divine otherness and ideas about interhuman difference. She is also co-editor, with Stephen Moore, of Planetary Loves: Spivak, Postcoloniality, and Theology (2010) and, with Catherine Keller and Michael Nausner, of Postcolonial Theologies: Divinity and Empire (2004). 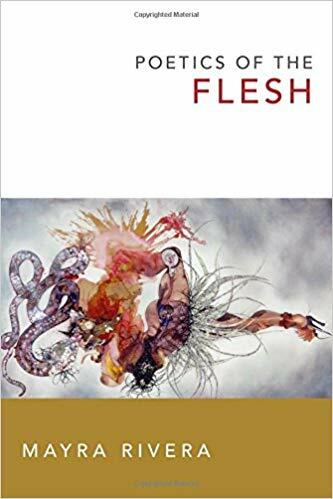 Her most recent book, Poetics of the Flesh (2015), analyzes theological, philosophical, and political descriptions of “flesh” as metaphors for understanding how social discourses materialize in human bodies."